652 cc / 39.8 cub. in. Front Wheel Travel 170 mm / 6.7 in. Rear Suspension Spring setting and rebound stage damping continuously adjustable. Rear Wheel Travel 165 mm / 6.5 in. Castor 123 mm / 4.8 in. Length: 2185 mm / 86 in. Wheelbase 1484 mm / 58.4 in. Seat Height 860 mm to 900 mm / 33.9 in. to 35.4 in. 176 kg / 388 lbs. 17.3 Litres / 4.6 US gal. Reserve Approx 4 litres / 1.1 US gal. Consumption Average 4.7 l/100 km / 21.4 km/l / 50.3 US mpg. 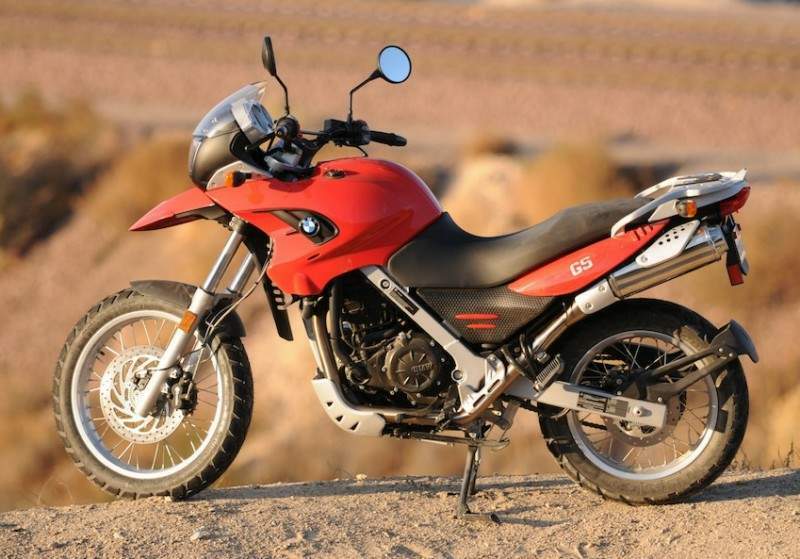 The most popular dual purpose single in the 250+ cubic centimeters category, the G 650 GS has become the standard upon which single-cylinder dual purpose motorcycles are judged. Aggressively engineered for unrelenting performance in harsh environments, the G 650 GS was designed to take riders off-road and on to new frontiers. The 2009 model features a 2 SPARK ignition system, a three-position clutch lever, newly designed windscreen, accessory power socket, and improved on-board electronics. I must admit that the BMW G 650 GS was not my first choice of bikes to ride. Usually there is more than one test bike in the garage, and the single-cylinder 650 GS was consistently getting overlooked in favor of faster and sexier machines, such as the Triumph Street Triple R and Buell Lightning XB12Scg. Like the best friend who is sometimes taken for granted when a fast-paced personality shows up, steals the limelight, and is more fun to hang out with-such was the 650's initial fate.